This weekend is the time to shop for those holiday foods for Christmas dinner. This is a fun time, planning the meal, deciding what would be festive and special. For many years now, we have done a Standing Rib Roast. Yes, a bit expensive, but it is Christmas and that is only once a year. These are not difficult to cook, and that post will show you step by step how to do it. 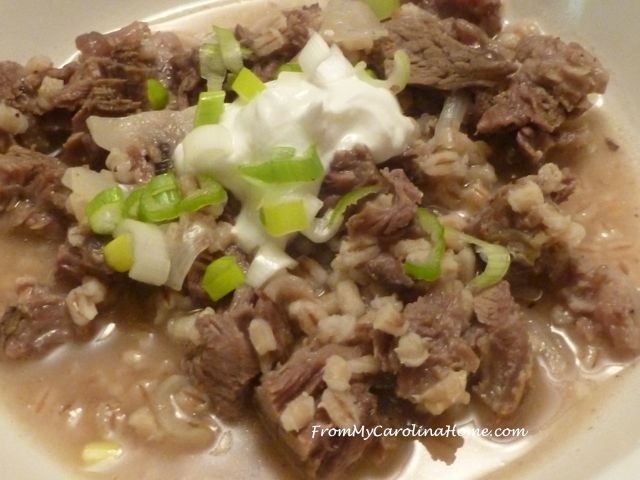 It becomes a bit more economical when the leftover prime rib bones are used to make Beef and Barley Stew, another easy recipe. Garnished with a bit of sour cream and green onions, it is a fresh meal a couple of days later that will warm you up on a cold day. 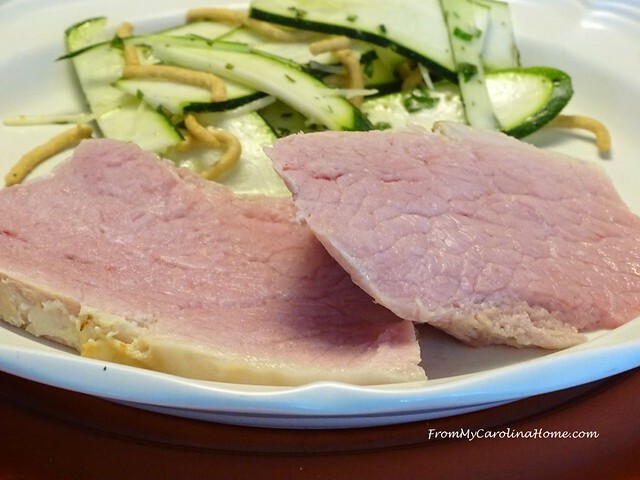 Many like to have ham for Christmas, and I have a post that will show you how to slow cook it using two different methods. 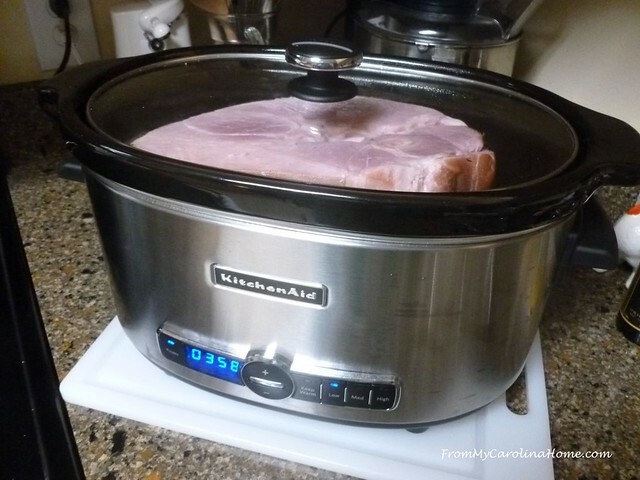 Slow Cooked Ham. First, if you have a large, 6-quart slow cooker (like my Kitchen Aid Programmable one), cooking a ham this way results in very juicy slices. 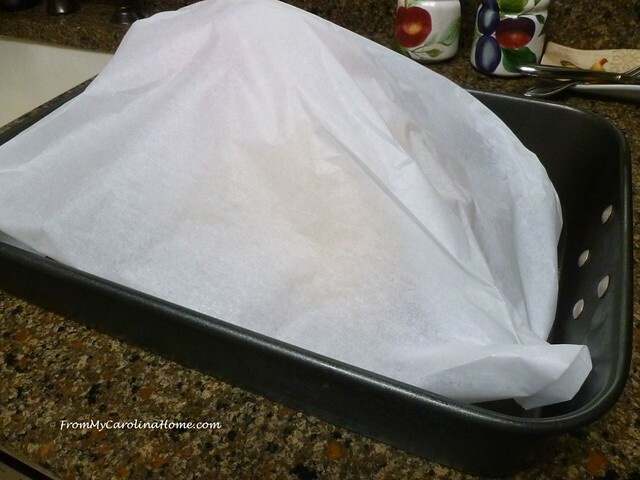 But if you don’t have one of those cookers, I’ll also show you how to slow cook in your oven using parchment to create a moisture shield. 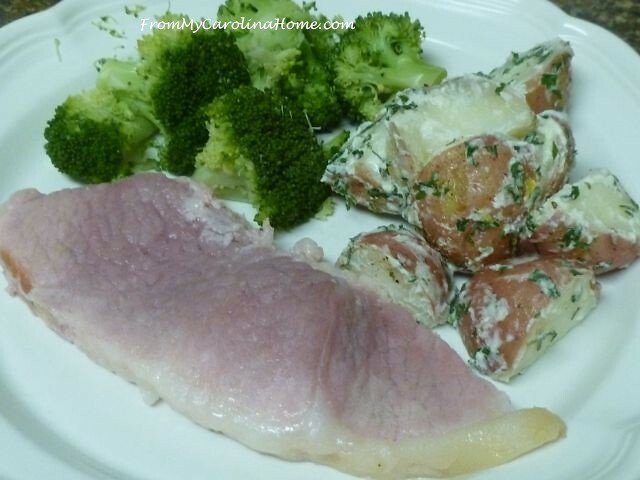 Now, for side dishes, Parsley New Potatoes With Sour Cream Sauce goes well with ham. 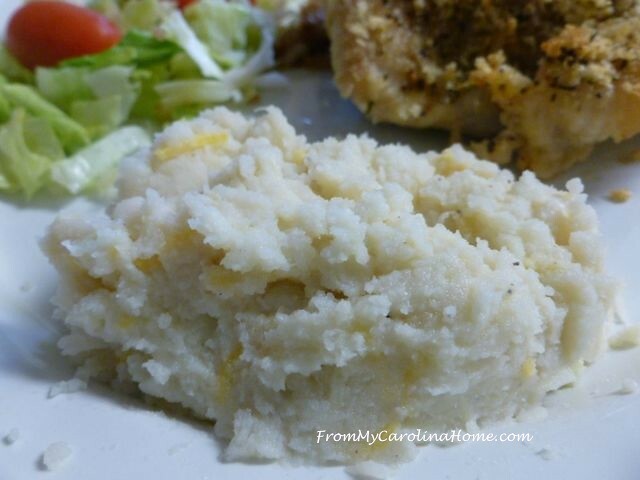 My Cheddar Onion Mashed Potatoes are also good for holiday meals as well as everyday. We have these with our Prime Rib on Christmas most of the time. But maybe you just want a simple meal for two. 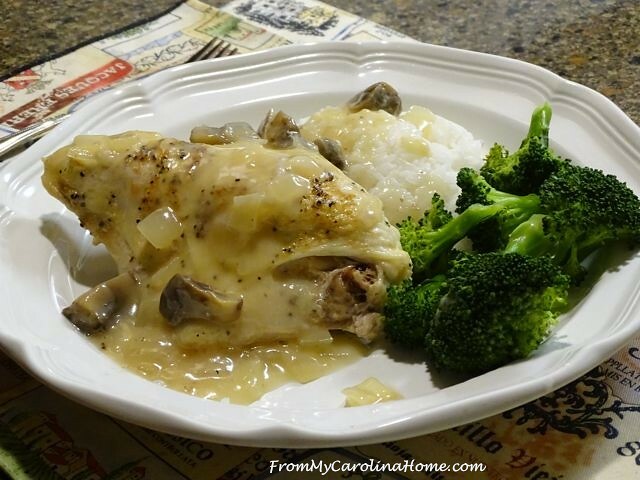 The White Wine Chicken and Mushrooms is good, and sometimes I add artichoke hearts to make it a bit more special. Roast some garlic this weekend so you’ll can make Roasted Garlic Butter and then try some of the recipes using it. 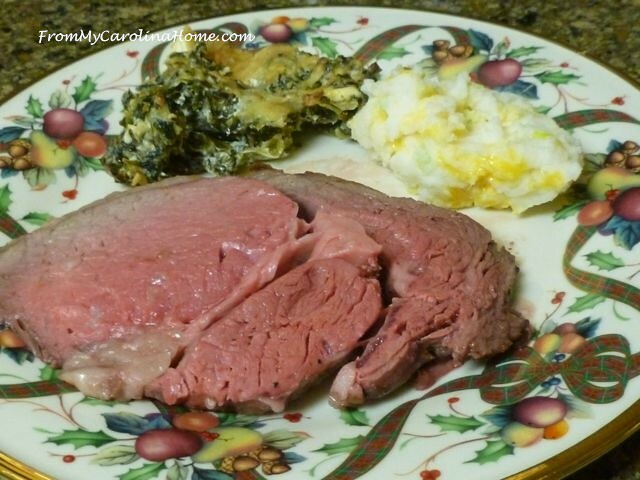 In the same post is my Baked Spinach with Roasted Garlic, another recipe I use with the Prime Rib, shown in the first photo. Perhaps you love turkey, but cooking a whole one is too much. 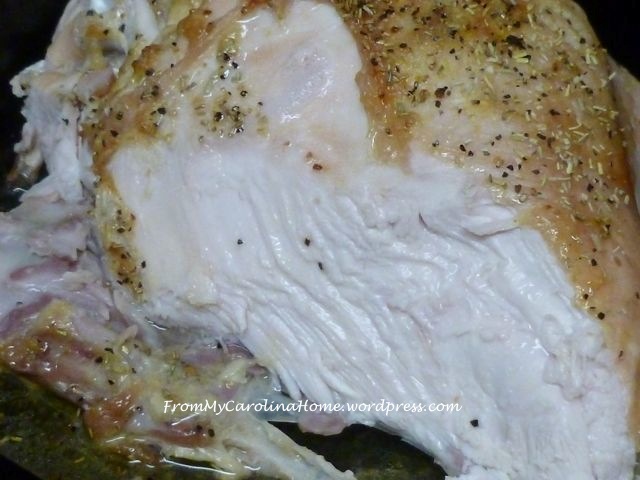 Using just a breast half to feed two, my Roasted Garlic Turkey Breast is yummy. 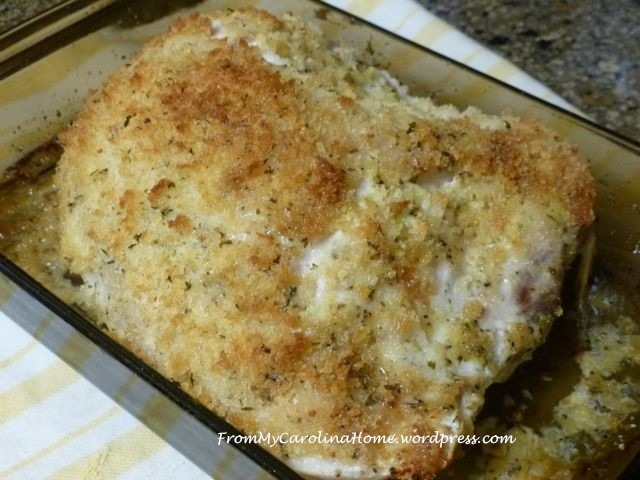 Another favorite turkey breast recipe is my Panko Crusted Deviled Turkey Breast. Flavorful and juicy with a lightly crunchy crust, it pleases most every palate. You can always adjust the spices and herbs to suit your taste. 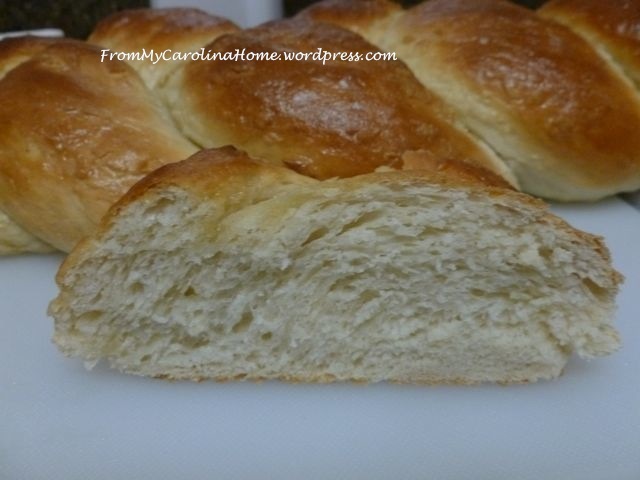 From a few years back, my Rustic Egg Bread goes well with a meal, and makes great sandwiches for the leftovers. It can be made a day ahead too. It just isn’t Christmas without cookies, but at this point it isn’t practical to bake dozens unless you have a cookie exchange this weekend or a big family coming for the holiday. 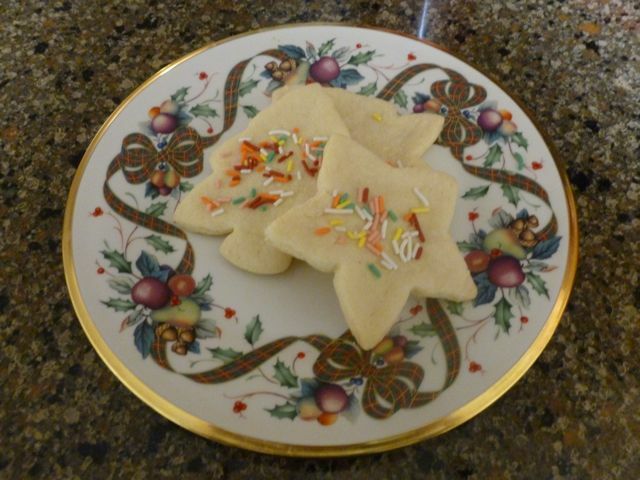 So, a few years ago, I did a recipe for Just a Dozen Sugar Cookies, a small batch recipe just for a few to decorate and enjoy. I updated the post this year with a way to do icing too. One thing I need to tell my faithful readers, Craftsy is making a big change to its offerings, significantly reducing the number of designers and pattern stores, and possibly reducing the patterns of the designers remaining. See their Store Changes FAQs. I am one of the lucky ones that Craftsy wants to keep, but they may not keep all the patterns I have with them. I won’t know until after the weekend. Get the free patterns now too, as I don’t know what will remain later. From now until 12/28, all the stores and patterns will remain on the site, so you have until the end of the week to get any that you might want, from my store or any others you’ve been thinking about. So, in order to help you shop, I’ve put all my Patterns on Sale 25% Off for Christmas! The regular price was $9, now $6.75 until Friday 12/28/18. Thank you for the recipe for just a few cookies. Can’t wait to try it! Have a wonderful Christmas. You have some great recipe ideas!!! Love your photos! They all look delicious and you’ve made a great recipe reference post–thanks! Merry Christmas, Carole!!! Well, thought I had Christmas dinner all fixed, but your ideas have me rethinking! 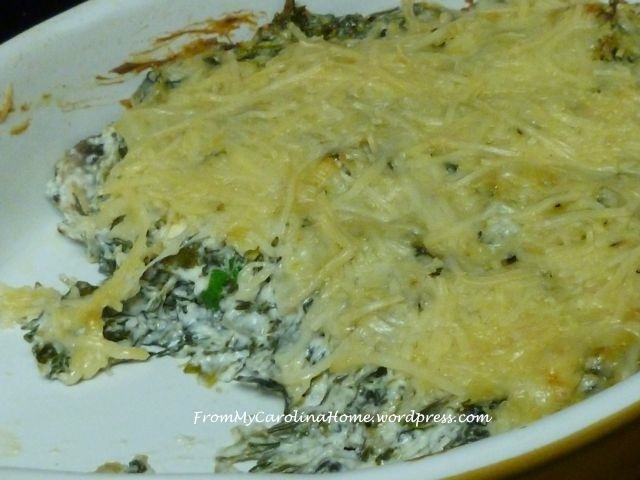 I have a recipe for Roasted Garlic Mashed Potatoes that is wonderful, and makes great soup the next day too, but I want to try your spinach dish and might modify the chicken dish to do leftover turkey. 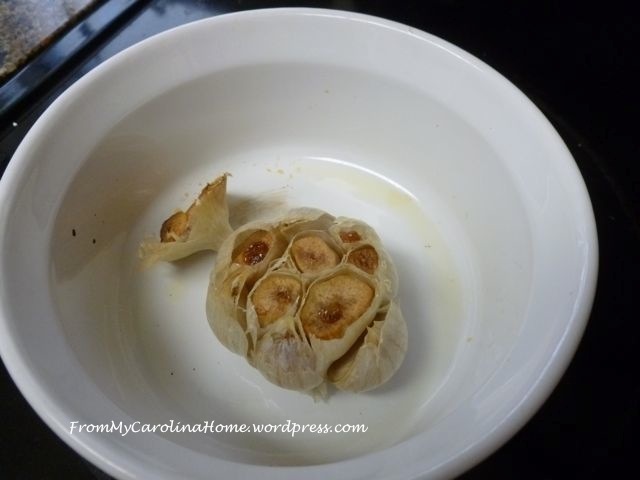 And for some reason I was adding chicken broth to the roasting garlic…guess I was steaming mine too…want to try it without! One thing I do instead of trying to keep white wine on hand is to keep a bottle of dry vermouth on the shelf. I think it substitutes nicely for the wine flavor. See what you think. It is always available then…not much temptation to drink in our household! Ha! You need to publish a cookbook, your recipes all look so Good…..I will be trying a couple of them real soon…..Merry Christmas & Thanks for a very interesting blog…I really enjoy reading it & have learned a few things as well…..Dot M.in Pa.
We are having a rib roast for Christmas this year; when we had the steer butchered we ordered the roast cut, so I hope it is good! Along with it we’ll have a green sale, roasted Brussels sprouts and twice baked potatoes. For dessert, I think I’ll do a plum cobbler. That barley soup looks like a winner for later in the week too! Lots of great recipes here Carole! I’m going to check out your egg bread, that looks amazing! Merry Christmas!! Thanks for sharing your recipes, they all look wonderful. I’m going to try the Spinach with Roasted Garlic for my daughter when she comes to visit after Christmas, and the garlic mashed potatoes too! I so enjoy your blog, thanks for sharing and Merry Christmas! Hello Carole, All of your recipes sound and look delicious! I look forward to trying a few of these that Hubby and I have not tried already. As for Craftsy, I just read another post about the changes that are taking place. I hope that everything works out the best for every designer. I must double check on the patterns that I have from you and make sure that I have them all. Have a spectacular day! Your dinners look marvelous. We will have our traditional chicken casserole. Christmas was the family holiday that we hosted. Since I was the organist and choir director at church, I had to have something that could be prepared well ahead of time to serve 20 to 30 people. Frozen cranberry salad is another traditional dish for us, as well as an English steamed Christmas pudding. OMG….I must get a new scale in the online sales….your dinners look too yummy not to cook!! Many thanks!!!! Thanks for sharing all your yummy recipes! I’m not cooking Christmas dinner this year, but I do want to make some cookies, and your recipe for just a dozen is perfect for us! I think I’ll make some tomorrow. family gatherings are so wonderful! Probably the most difficult part for us, this year, is deciding where/who is going to host. make the gathering. My sister loves to have everyone over at her house in Maryland and we love driving the Washington Beltway to get there (haha). However this year, we have given in to the babies, and my youngest daughter wants to have all of us on Christmas day. I am excited. There will be a lot of food. Your recipes look delicious. I’m fixing a spiral sliced ham, smashed potatoes, candied sweet potatoes, green beans and rolls. That seems plenty for only the two of us. I already closed my account on Craftsy. I’ve not been happy with any of the changes NBC has made, and I don’t like their taking away from designers this way. So I chatted with an employee and had it all deleted. Looks like we are in for a hot Christmas Day so it will be ham and salads for us. I need to come over your way for a roast meal on a cold day. Carole, what delicious looking food! Merry Christmas to you and yours! I can hardly type for drooling. Don’t ever give us your address or you’ll have hundreds of unexpected guests for dinner!! We have family coming on Christmas Eve and rather than a dinner, we graze on party-type food like cocktail hot dogs, cocktail meatballs, chipped beef bread dip, artichoke dip and 3 kinds of cookies. Since there are usually lots of leftovers, DH and I just continue to use them up instead of a formal Christmas Day meal. The Craftsy changes are disturbing, but not surprising. When NBC Universal took over promising things would remain the same, I didn’t believe it especially when the subscription service started. With all the incentives they have offered I’m sure they got a lot of people to sign up, but I bet many won’t renew when it goes to full price. Hope you have another way to sell your patterns. But enough of that. Have a Merry Christmas. Merry Christmas, Carole! You sure have a lot of choices for Christmas dinner! We celebrate with my in-laws on Christmas Eve and that will be turkey. Then Christmas day is cheese fondue. That was my Christmas Eve tradition growing up and I moved it to Christmas day since the in-laws like to celebrate Christmas Eve. I think I might try your egg bread around New Year’s.